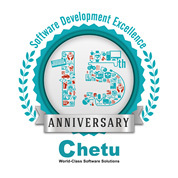 Plantation, FL (April 1st, 2015) - Chetu Inc., a global provider of software solutions, is celebrating 15 years of software development excellence. Founded on April 1st 2000, Chetu has grown from a small enterprise, with only a handful of experienced developers, to an industry leader in technology development. Starting in a small office in Miami, FL, Chetu has grown to include more than 1,200 developers, sales team members, and administrative staff across nine offices, which includes its headquarters in Plantation, FL, plus satellite offices in Amsterdam, Las Vegas, Chicago, Dallas, Nashville and Tampa, as well as two state-of-the-art development centers in Noida, India. Since its inception 15 years ago, Chetu has used innovation and creativity to provide world-class software development solutions and services to forward-thinking clients. This mission is the key component to Chetu’s organically grown success to become the company it is today. Chetu’s modular approach to a seamless back-end development partner of high-quality software has earned Chetu a spot in the prestigious Inc. 500|5000 list of fastest growing private companies in America for the past three years. Chetu is a 15-year old software development provider that delivers world-class software solutions serving entrepreneurs to Fortune 500 clients. With a growing team of over 1,200 skilled engineers spread across seven global locations, it is able to provide a modular approach that fits customers' budget, yet does not compromise on local interaction or real time collaboration. Beyond providing software resources, Chetu excels in providing industry specific and niche technology solutions for healthcare, retail, finance, telecom, gaming, hospitality, travel, e-learning, supply chain and many others. Its services include process and systems design, package implementation, custom development, business intelligence and reporting, systems integration, as well as testing, maintenance and support. Chetu's expertise spans across the entire software technology spectrum. For further information please visit https://www.chetu.com/.